I was famished when we arrived in Vienna so we did not waste time seeking out a place to eat. We went to the closest restaurant across the main train station. The first thing I noticed when I entered the restaurant was a display of pastries. Thinking that it was not serving the kind of lunch I was looking for, I left and went to the restaurant next door. However, the restaurant next door had the same set-up. I found an overwhelming variety of savory baked goods, cookies, cakes, chocolates and marzipans (my favorite). Little did I realize that the restaurants we entered were coffee houses? We ended up walking from one Café to another and ended up buying a piece of marzipan, chocolate, tart or apple strudel here and there. We found a table outside and happily consumed our lunch (pictured below). At home, I’m usually a model of temperance when it comes to sweets. I usually eat fruits for dessert and when eating out, I would only order gelato or ice-cream and cut fruits for dessert. Perhaps it was hunger and seeing the beautiful display of pastries that brought out the cookie monster that was lurking inside of me. Feeling guilty for not having a 'proper lunch', we went back to the first coffee house/restaurant we saw and ordered Wiener Schnitzel (Viennese Chicken Cutlet) with French fries and salad from the menu. Almost all coffee houses in Vienna provide small food dishes like wiener schnitzel or sausages as well as desserts, cakes, and tarts, like apfelstrudel (apple strudel), millirahmstrudel (milk strudel), Linzer torte, and Punschkrapfen cake (a classical Austrian confection of pastry with a fine rum flavor). After lunch, we walked the City Center streets to visit St. Stephan’s Cathedral. We didn’t have to walk more than a block before running into another sweet temptation. 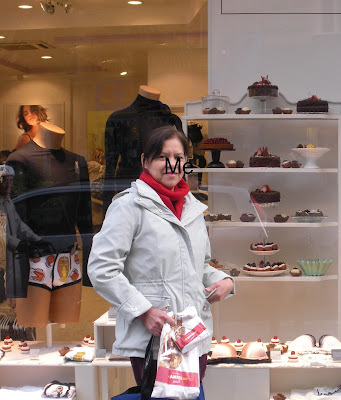 We passed so many confection stores and cafés - from a tawdry lingerie/confection store to the classy Café Sacher. I saw a few ‘Aidas’ juxtaposed to McDonalds fast food chain store. I realized later that Aida was a chain of café bars and pastry shops. A few steps from St. Stephan's Cathedral, we found the fancy ‘Hotel Sacher Wien’ and the Café Sacher. 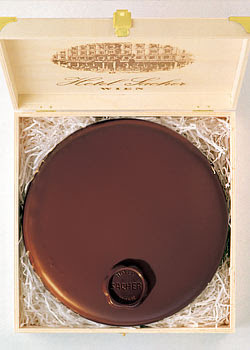 It was there that the famous Viennese cake, Sachertorte (a chocolate sponge cake cut into three layers, between which apricot jam is thickly spread between the layers, on the top and sides of the cake, and iced with a velvet-like chocolate), was born. The coffee house retained its ‘traditional coffee house’ character. Next to the coffee house was an in-house confectioner, the Sacher Confiserie, where we bought the world-famous Sachertorte and Viennese coffee to take home. It's mouth watering and makes me salivate!!! Thank you for nice article! Chocolate and cookies in Austria are delicious. We will be there on Christmas and i'm planning to eat a lot of sweets. I've not decided one thing yet. Should we use taxi booking http://kiwitaxi.com/Austria/Vienna+Airport or public transport for transfer from the airport?